When you have gotten enough of sun, sand, and sea in Sitges, you should visit the large food hall in Sitges. Here you can get a glance of what culinary products Catalonia may offer you. A great place on your last day of your stay. Maybe you can bring a taste of Spain with you! Cold cuts for sale in one of the butchers at the market. Pit de Gall, is, according to google, cold ham, here made from Turkey meat, here for sale from 10-17 euros a kilo, a real bargain, if you ask me. This is food that really goes a very long way. A similar product would have been sold for twice or three times the price here in Norway. Another product is Pernil extra Llauna, supposedly (according to google) a boiled ham. 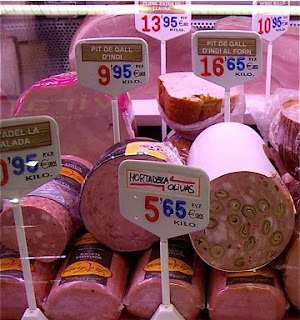 The Mortadella d'Oliva is a real treat, a large Italian style sausage with large cubes of fat with pistachio nuts or as here olives, served in very thin slices. 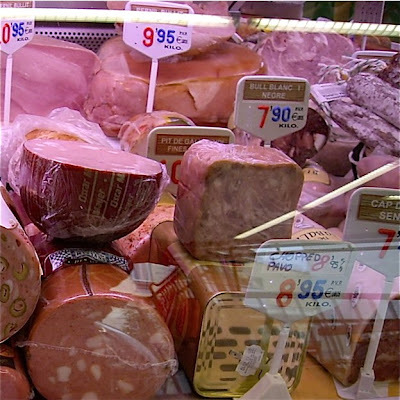 These are products that are easily spoiled and need refrigeration, and therefore not very easy to get home. Try to find a good chorizo or cured ham instead. It will keep for weeks, even months, and can take hours without cooling and still have good quality. Fried squid or cuttlefish is a real treat. Crisp on the outside, soft and tender on the inside (if you have not over cooked them). Serve them hot, with a quarter of a lemon and with sauce remoulade. In my hometown Oslo, you can buy them frozen and in large quantities. 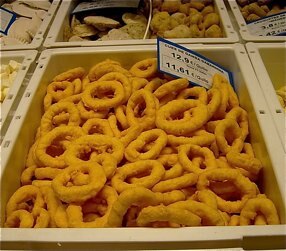 At Sitges food market you can just ask for a handful or two, enough for one dinner. Easy and convenient. You pay around 12 Euros a kilo, and that amount will feed 3-4, depending on their appetite. A really inexpensive snack! 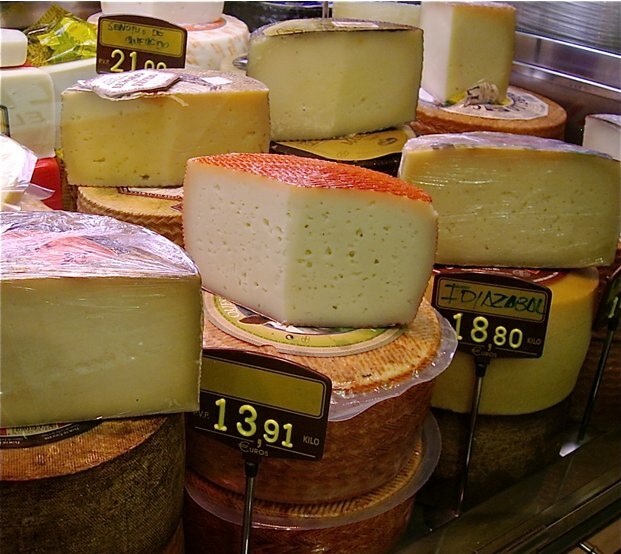 Cheese is also food that is convenient to bring home with you, and Spain has many to choose from. I do recommend hard cheeses as these seen on the picture, as the famous Manchego, resembling the Italian Parmigiano. Cheese as Manchego can be eaten with bread or cubed and served as a tapas dish. Cheeses as these are in general more expensive than many fresh meats and cold cuts. A kilo may cost you way over 20 Euros a kilo. Cansalada salada - lard or fat streaky bacon? Cansalada Salada is not you typical politically correct foods. This is very fat bacon borderline lard. Funny enough, Italians and Spaniards are much thinner than most Northern Europeans, but many enjoy some of the most fat diets you can think of. Industrial amounts of olive oil, and products as these. 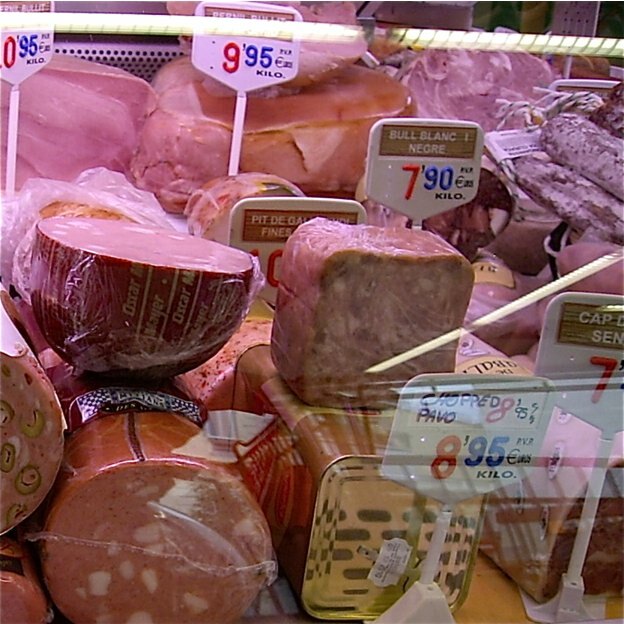 Italians consider solid cured and salted pigs fat a real delicacy. 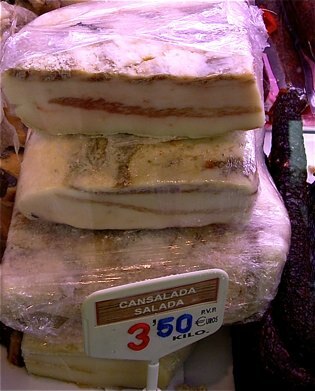 They cut extremely thin slices of lardo and serve them on hot toast, and the heat makes the salt lard melt into the bread. Some told me once that saturated fats as these will turn into polyunsaturated fats if salted and cured. It may be an excuse to indulge in a product as this. I wonder whether it is used as bacon as in eggs and bacon or used in another way. Maybe some of my Catalan readers may inform me? These traditional food markets are great! Remember how much fun we had in Barcelona? And even in the smaller market in Gothenburg. The one in Valencia is like a food cathedral. Well worth a visit -- and Valencia has its own beach as well, easily accessible by tram. Chicken carcass for sale - real budget food! Lunch next weekend in Oslo? Try Food Story!